The 2015 Forbes America’s Best Colleges rankings are out, and there is a new wrinkle in the methodology: The magazine “ran a targeted student satisfaction survey on Facebook. Respondents were asked where they attended school and how satisfied they were with their experience on a scale from 1 to 5.” The result yielded 2.5% of the total score, and was incorporated into the 25% subtotal in the “Student Satisfaction” metric. We do not know exactly what “a targeted student satisfaction survey” is, but throwing something new into a ranking system helps to sustain interest. The survey didn’t help public universities overall. The average ranking of the public universities listed in the top 100 dropped more than 14 places in just two years. Only William & Mary rose during that time. Incredibly (literally), the Penn State ranking has fallen 59 places in two years; Maryland and Washington 20 and 21 places respectively. What could have happened in only two years to create such results? For 2014, Forbes or, rather, the very conservative Center for College Affordability and Productivity (CCAP), which does the work for the magazine, increased the weight of the student debt factor from 17.5% to 25%. At the same time, the weight for “Academic Success” went down modestly, from 11.25% to 10%. Both of these probably hurt public universities: the debt, because state support still has not caught up with costs; the academic success because CCAP counts National Science Foundation Fellowships and Fulbright awards, many of which are won by students and faculty at public research universities. In 2013, we wrote that the Forbes America’s Best Colleges rankings had suddenly become more friendly to public universities after several years of relegating many of them to the high three figures in the numerical rankings. In that year, 19 public universities (not counting the military academies) made it into the top 100; in 2014, that number dropped to only 14. This year 13 were among the top 100. Although UC Berkeley, UVA, Michigan, and North Carolina all improved slightly in 2015, they are still, on average, more than 10 places below where they were only two years ago. It is not unusual for anyone who ranks or evaluates colleges to make changes in their ranking methodologies. We have done the same for our curret edition of the Review, although we did not use numerical rankings this time around. At least the bizarre rankings that marked the Forbes list for the first few years have mostly gone away. No longer do we see, for example, a university ranked 320th one year and rise to 168th the next. And it is good to keep in mind that the Forbes rankings lump all private and public universities and liberal arts colleges into one huge group; so a Forbes ranking of, say, 65 or 70 for a public university is a much stronger ranking than a U.S. News “national university ranking” in the same range. Still, it is difficult to understand how some of the public universities could have dropped so far in just two or three years. The graduation rate value of 7.5% of the total, not adjusted for schools (e.g., Georgia Tech) with high numbers of engineering students, is punishing for some schools. Georgia Tech now has fallen 10 places since 2013, all the way down to 93. Below are the Forbes rankings of public universities that were in the top 100 in 2013. The first parenthesis is the 2013 ranking, the second is the 2014 ranking, and the third is the 2015 ranking. The rankings are based on the responses of 1,500 Business Insider readers, most of them from the finance and tech sectors. “Almost 30 percent of the respondents work in finance, 22 percent work in technology, 9.9 percent work in education, 9.9 are current students, 9.2 percent work in media and marketing, and 8 percent work in law,” according to the publication. Also interesting is that BI combines national universities and liberal arts colleges in the same list, just as Forbes does. Bill Destler, president of Rochester Institute of Technology, recently posted on the Huff Post College Page that college rankings are universally deficient because of their focus on “inputs” such as SAT scores and high school gpa’s. He might well have added financial resources to the list. Although we have published a de facto ranking of public university honors programs that isn’t based on any of these criteria, we agree that all rankings, including our own, have deficiencies. We also agree with Destler that the annual Forbes rankings are the most deficient of all because, even though they claim to rely on output measures, they also focus on “data” from Rate My Professor and Payscale.Com. The first is subjective, and the second reduces the value of a college education to dollars and cents. The Forbes rankings also have a strong bias against public universities, part of which comes from a desire on the part of the people behind the rankings to “reform” public universities so that they become places for cheap, assembly-line education rather than research institutions with outstanding academic programs. Destler also points out that rankings based on return on investment will only affirm what most people already know: universities with large numbers of STEM grads, especially in engineering, will necessarily fare better in the rankings because engineering as a field often provides excellent starting salaries for new graduates. Destler is also correct in claiming that all rankings distort the value of universities to the extent that their rankings methodology apply uniform input measures to essentially dissimilar institutions. Grad rates for a private university that accepts only 6 percent of its applicants will clearly be higher than a college with a 65 percent acceptance rate based on the extremely selectivity of the former. In the case of our rankings, we would say that the overreach is somewhat less severe, since all the honors programs we follow have much lower acceptance rates than most colleges and because our dominant category is honors curriculum, which can be extensive and demanding regardless of admissions requirements. In addition, we have two basic rankings, Overall Excellence and Honors Factors Only. The former does generally favor honors programs in universities that have more uniform excellence across the student body because there is a metric for achieving Rhodes, Marshall, Truman, and Goldwater awards by all students, and not just those won by honors students. 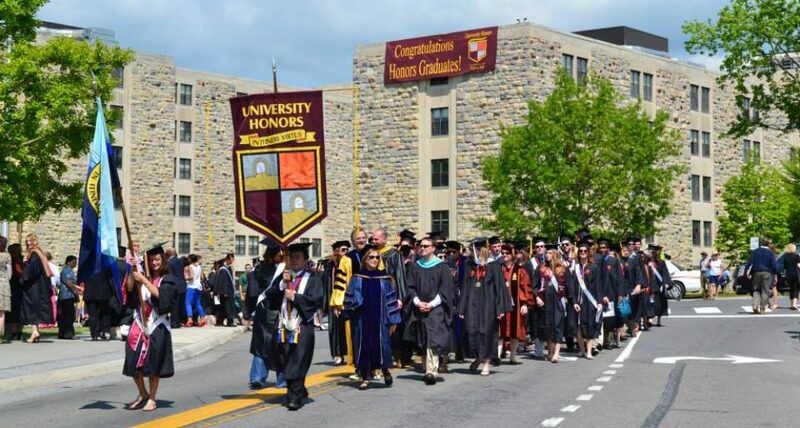 But Honors Factors excludes the metric for prestigious award and is based strictly on honors-specific elements such as curriculum, grad rates, honors housing, and study-abroad programs. In the end, our rankings are only suggestive, not definitive. The same is true for all rankings. They are best used to suggest possible routes on the journey rather than pinpointing the final destination.